Just a quick update here from Canada, where we are still enjoying our long weekend! It's the Victoria Day weekend, so naturally we have been celebrating Queen Victoria by drinking beer and setting things on fire. 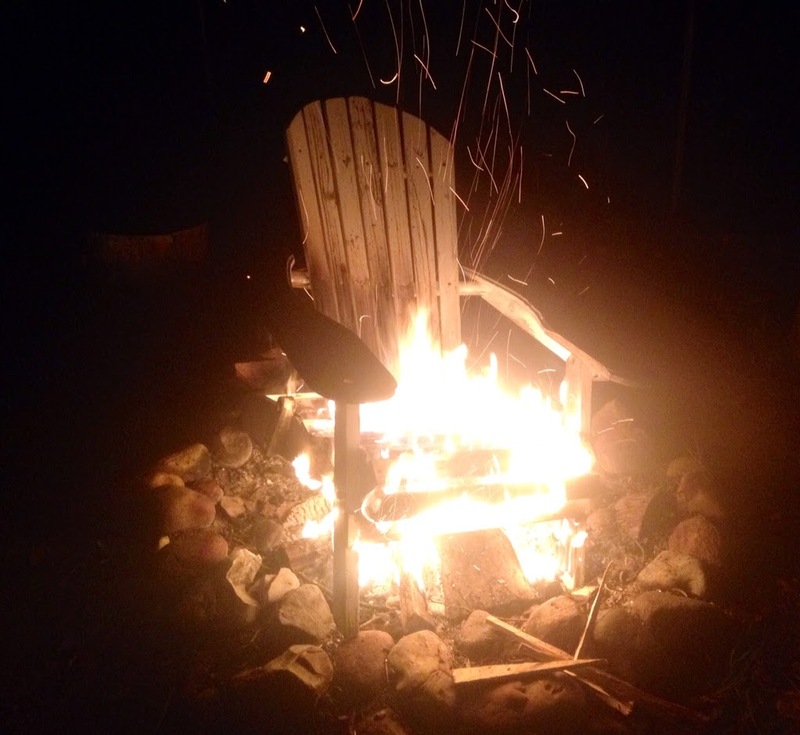 We had a fire down at my Mum and Dad's cottage two doors down from us on Friday night and this adirondack chair ended up on the campfire at some point. It may sound strange, but my parents seem to have a furniture-burning fetish...the next night an old wicker coffee table found it's way to the flames. It's just old ratty stuff that would end up at the dump, just my dad's way of reducing his carbon footprint I guess. It is kinda fun to watch (from afar) these things go up! It's been a great weekend here so far with clear skies and warm temperatures...near perfect really, considering we were expecting clouds, rain and cool weather. It was cold however on Friday afternoon when I was bound and determined to ride my bike up to the cottage. It was cloudy and only about 9°C/48°F with some sturdy wind to boot. I threw on my long sleeves and set out for my longest ride to date. I had mapped out a route that would take me down mostly back roads in the hopes that I would avoid a lot of the traffic, but there's always that fear on a long ride of being found in a ditch somewhere...fears for both the rider and their family. I've been saying to Michelle for a little while that I should find some sort of app that tracks you with your GPS and sends updates to people, thinking it would be great during a race or long training runs or rides. Well I searched and came up with an app for Road ID. Most runners and triathletes have probably heard of Road ID already, through their ads in running magazines and triathlon publications, but for those who haven't heard of them they make ID bracelets with your personal and emergency contact information to help first responders in the case of an accident. The Road ID app lets you send a message out to up to 5 people letting them know that you are going out for a run or ride, and that you expect to be back in a certain amount of time. 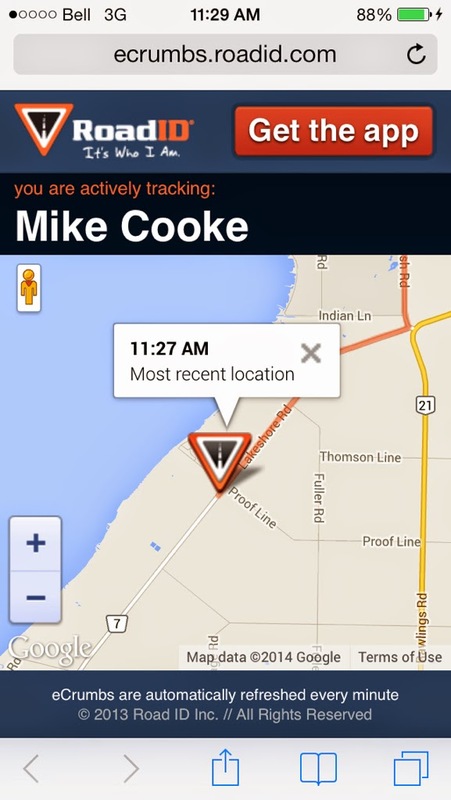 The app notifies your contacts with a text message that includes a link to a GPS tracking site, showing your peeps where you are on your ride. It also has a couple other cool features, such as being able to notify your contacts if you have been inactive for 5 minutes and the ability to customize your lock screen with your emergency info as well as someone to contact in an emergency. Definitely some peace of mind for you and your loved ones while you're out on the road...this is an app I will use! And one of the best things about the app, you can click here and get it for FREE from the Apple App Store. I was actually willing to pay for this app (which is saying something) when I found out it was free. Sorry Android users, it's only for Apple right now...though developers are working on a version for you guys too. Back to my ride (and ending my unpaid for endorsement)...it was a cold ride. My hands and feet were pretty numb, my legs were shredded from the hills but I really did enjoy it. The route I mapped out was supposed to avoid dirt roads, and any of the new-to-me roads were paved...though one was a pretty beat up asphalt that was mostly bumpy stones. The killer for me was a road I take all the time which has always been pretty bad for potholes...within the last week the county must have just said "eff it" to continuously repairing the road and they just dumped a bunch of loose gravel on it. Not great for a road bike! By the time I turned off the road my tires were white, and so were my knuckles. The rest of the weekend featured a nice 10K run on Saturday and another solid 40K+ ride on Sunday. Michelle and my Mum have continued their half marathon training as well, getting out to run every day. We will be heading back home later today, but it sure looks like we have one more nice day in store. Blue skies and it's already up to 18°C (mid-60's)...perfect. My goal for today is to jump in the lake and test out my new wetsuit. Everyone thinks I'm crazy as the lake is still ice cold...some of the younger kids wanted to test the water and they lasted about 10 seconds. I only have 30 days to test out my suit though, so gotta bite the bullet and take that plunge! I'm cold just thinking about it. Well, Happy Victoria Day to our Canadian friends, and for our American pals, it's almost Memorial Day so that should help get you through your Monday! Do you use anything on your runs to let your loved ones know where you are? Ahh long weekend!! I'm am looking fwd to mine at the end of this week!! Enjoy! Sounds like y'all are having a great long weekend - enjoy!! That app sounds awesome. My new Garmin is supposed to do something similar but I'm not sure that I installed everything exactly right - oops!! Furniture burning fetish! Lol thats so funny! Sounds like a nice weekend! haha best way I could describe it! Those cats will burn anything...my parents are freaking pyros! OMG thanks for sharing the RoadID app! I bought the RoadID bracelet for my boyfriend (cyclist) cause I worry about him when he leaves. I'm going to download this app on our phones now too! 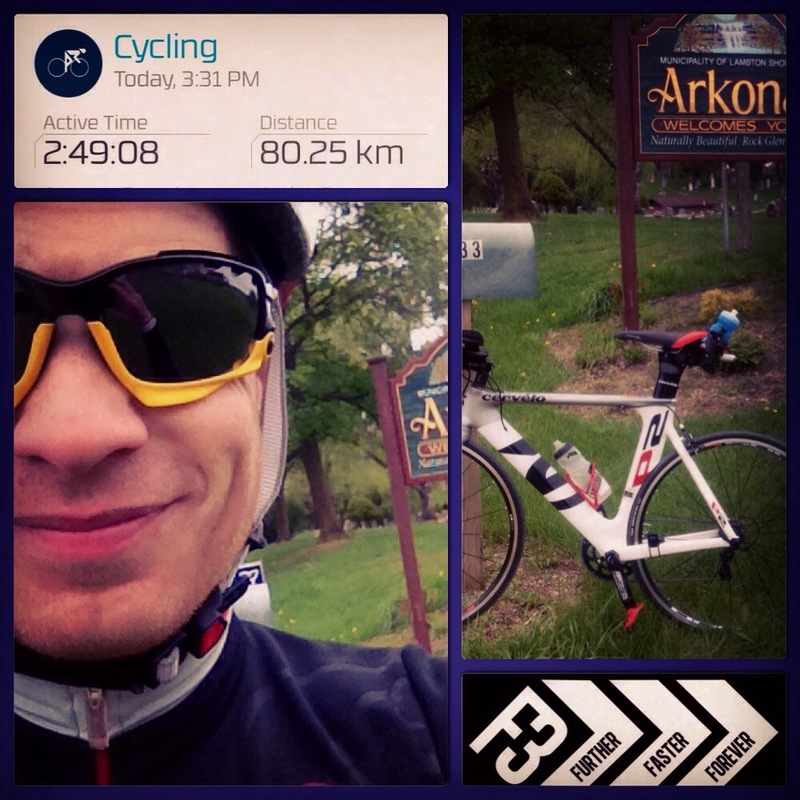 It's an excellent app for sure, great for runners and cyclists. He can even use it to track you during your races in case he wants to see you on the course or something.